@bethbathnbeyond Hot, Hot, Hot!! Win prizes HOURLY from Bed, Bath and Beyond! Entry Dates: Begins on July 7, 2010 and ends on September 7, 2010 at 11:59 p.m. ET. Limit: One (1) entry per envelope. All mail-in entries must be handwritten. All mail-in entries must be postmarked September 7, 2010 and received by September 14, 2010. Entry Limit: Each participant may enter/play the Sweepstakes and the Instant Win Game one (1) time per day during the Promotion Period, regardless of method of entry. Tell A Friend Program: For each referral of up to three (3) friends with valid email addresses, you will be given one (1) additional entry into the Sweepstakes up to a total of three (3) additional entries per day. (1) GRAND PRIZE: A $15,000 Shopping Spree and Design Consultation with an HGTV Designer. This includes an in-home personalized design consultation with an HGTV on-air designer, personal shopping experience at a local Bed Bath & Beyond store nearest winner’s home with the designer. In the event the closest Bed Bath & Beyond store exceeds 25 miles from the winner’s home, the HGTV designer will shop online with the winner on www.bedbathandbeyond.com. Prize is awarded as a $5,000 Bed Bath & Beyond® Gift Card and a $10,000 check, to fund additional design/decorating purchases. ARV: $20,000. 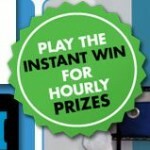 Prize Limit: One (1) Sweepstakes Prize and (1) Instant Win Game Prize per person. Drawing Date: On or around September 21, 2010. It tells you in small print you won then you receive an email confirming the win. What time should I play to win? I won a $25 gift card early this morning! Thanks Sweetie! You’ve won a $25 Bed Bath & Beyond Gift Card! Look for an email with prize details. It was 10:55 so I thought maybe I should wait for the next hour. Good thing I didn’t! I think I might have won. I didn’t know it said in fine print about winning. Then when I read comments here. I looked for it after I played. Now I see in fine prin where it says. Limit: One (1) Instant Win Game prize per person. Could this mean I have already won? I dont recall seeing a winning e-mail from them. Do you have to conform something in the e-mail? Please help. I dont want to be out $25 bucks. There’s nothing you have to confirm. I won on the 5th and my card came last week as a certified letter. I try so manny times but i do not no how to do it.plase can some one let me know how can i do it.